Polishology: Christy's First Blue Nails! When I was visiting my sister a couple of weeks ago, my nail polish addiction started to rub off on her... we went to Ulta and she purchased some of her first ever blue polishes! After I left she continued to go shopping to pick up some new colors she had never worn before.. I am so proud of her, haha! While we were visiting, I gave her her first ever blue manicure! For these nails, we started out with two coats of China Glaze Adore, which is a completely gorgeous metallic blue with a hint of green. This one was my polish, and I have not worn it yet but it is stunning, and I cannot wait to wear it myself. I feel like I am getting too many polishes, there are so many pretty ones I haven't gotten the chance to wear yet! On top of this base color, we added flowers from Konad plate m64 using OPI Ink, which was one of the new polishes Christ picked up. It stamped really nicely, and is a really nice color. I haven't bought this one yet but it is a polish I have considered many times! Very pretty. Yay!! 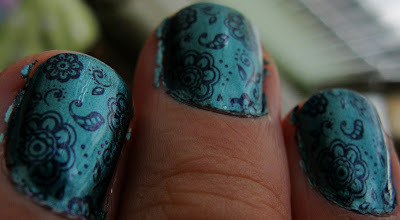 my nails are finally on your blog :-) I miss this manicure, it was very pretty. Love you (both)! Some Amazing Promos from ZOYA!